Several clinical and hemodynamic variables potentially factor in the immediate post-procedural and long-term outcome following percutaneous coronary intervention. The proper identification and definition of risk is a crucial prerequisite to implement adequate supportive measures and potentially avoid procedural complications. Discriminating coronary lesions based on their complexity has important implications for procedural planning and to predict (and prevent) the onset of procedural complications. However, the characteristics of a coronary lesion should be contextualized with the clinical presentation and patients’ risk profile to get a 360° vision of PCI complexity. Levine GN, Bates ER, Blankenship JC, Bailey SR, Bittl JA, Cercek B, Chambers CE, Ellis SG, Guyton RA, Hollenberg SM, Khot UN, Lange RA, Mauri L, Mehran R, Moussa ID, Mukherjee D, Nallamothu BK, Ting HH; American College of Cardiology Foundation; American Heart Association Task Force on Practice Guidelines; Society for Cardiovascular Angiography and Interventions. 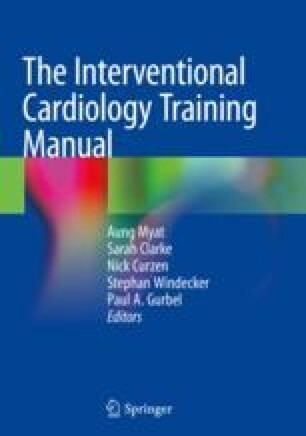 2011 ACCF/AHA/SCAI Guideline for Percutaneous Coronary Intervention. A report of the American College of Cardiology Foundation/American Heart Association Task Force on Practice Guidelines and the Society for Cardiovascular Angiography and Interventions. J Am Coll Cardiol. 2011;58(24):e44-122. doi: https://doi.org/10.1016/j.jacc.2011.08.007.